Junior Joy Heady takes a puppy for a walk as part of Puppies with Purpose, a Columbia organization that socializes the animals to be trained for service. Photo by Nicholas Benner. Barbara Hammer, director of the Office of Disability Services, has no idea how many service animals are on campus. But she has good reason for not knowing. 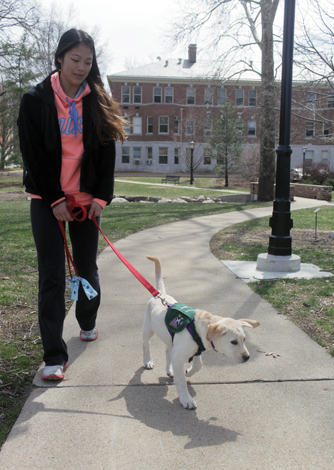 Service animals can go anywhere their handler goes, including anywhere on campus. 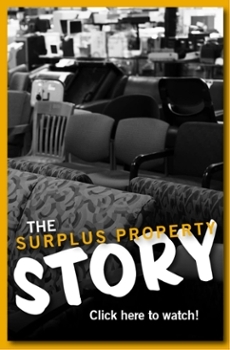 There is no roster, registry or approval procedure. Though the actual number is unknown, service dogs are not uncommon on campus — all the more reason for the university community to understand service animals and their relationship with their handler. A service animal is any dog individually trained to provide assistance to someone with a disability. A guide dog is used by the visually impaired. Service dogs can also be trained to aid people with hearing impairments, mobility impairments or to respond to medical events such as seizures. However, federal regulations don’t set standards specifying the amount or type of training that an animal must receive to qualify as a service dog. “It’s not like the dog is not a service animal until it gets certified,” said Adam Kruse, Columbia's Americans with Disabilities Act coordinator and assistant city counselor. “There are some organizations that offer to certify animals, but it’s not necessary,” Kruse said. “The animal must have individual training to perform a task related to the person’s disability. There are only two questions an administrator can legally ask a handler about his or her service animal, according to the U.S. Department of Justice. Is the dog a service animal required because of a disability? What work or tasks has the dog been trained to perform? Handlers cannot be asked about their disability or to provide medical or training documentation for the service animal. Unfortunately, ignorance and confusion still remain about the animals on campus. The biggest misconception is the relationship between handler and service animal. “They’re dogs, but they’re not pets,” said Julie McGinnity, a vocal performance graduate student from St. Louis who worked with a guide dog for five and a half years. “Service animals are an extension of us,” she said. The relationship is more like a partnership. A service animal is a tool for the handler. That’s why people should ask the handler first before reaching down to pet a service animal. As it warms up in Columbia, the MU community might be seeing more students walking puppies on campus. Through Puppies with Purpose, a nonprofit Columbia veterinarian TerriAnn-Tucker Warhover started in 2012, about 30 students socialize puppies that eventually will be trained to be service animals. Puppies with Purpose receives a puppy when it is around seven weeks old. Students socialize the puppies, then they are trained to become service animals at a center in Vandalia, Mo. Annie Piasecki, a senior journalism major from St. Louis, said she joined the organization for the puppies but stayed for the purpose.